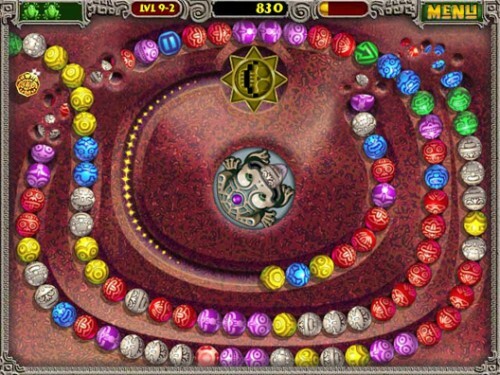 Zuma Deluxe is an interesting puzzle game for you. Survive the ancient temples of Zuma, the critically acclaimed action-puzzler! Deep in the jungle lie hidden temples bursting with traps and trickery, and it?s up to you to uncover their treasures. Fire magical balls from your stone frog idol to make matches of three or more and clear the deadly chain before it reaches the golden skull. Zuma Deluxe game is an interesting puzzle game for free. Explore all the temples if you are good, you will rack up huge combos and special bonuses that will help you on your way. But think fast and aim smart, or you will be history in this action-packed puzzle challenge! * 3D accelerated graphics and effects. * Stunning sounds and tribal tunes. * Explore the Adventure mode and test your skills in Gauntlet mode. * Over 20 temples to explore! Qweas is providing links to Zuma Deluxe 2011 as a courtesy, and makes no representations regarding Zuma Deluxe or any other applications or any information related thereto. Any questions, complaints or claims regarding this application Zuma Deluxe 2011 must be directed to the appropriate software vendor. You may click the publisher link of Zuma Deluxe on the top of this page to get more details about the vendor.